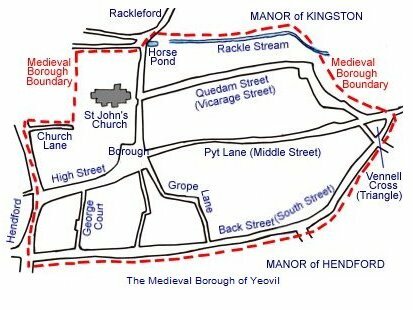 In mediaeval times much of the northern boundary of the Borough was a small stream or brook called the Rackel, or Rackle. The Rackel ran across the road, now the junction of today's Silver Street and Market Street, where there was a shallow ford. Indeed, in a document of 1355, today's Market Street was referred to as Ford Street. This ford across the Rackel led to Ford Street becoming known as Rackleford, or Reckleford, not to be confused with today's Reckleford which in earlier times was known as Reckleford Hill. Alongside the Pall Tavern was a pond called the Horse Pool, or Horse Pond, fed by the Rackel, which then flowed out the other side to continue eastwards. The Horse Pool was used to water horses and was the original site of Yeovil's ducking stool. In the Churchwardens' accounts for 1676 is noted a payment of 6d "Payd Thomas Spurticke for cleaning the hose poole" and in 1694 a payment of a few pence was paid to "Sam Eglin for a hatch att horse-pool" inferring that the pool was perhaps covered? or at least fenced in? A lease dated 24 July 1759 between George Prowse of Yeovil, Esq., and William Daniell the Younger of Yeovil, Glover, refers to "A piece of ground at Court Ash on the north side of the highway running up to the brook that runs from Kingston to the Horse Pond in Yeovil measuring 300ft long and 3ft wide with full liberty of William Daniell to erect a wall and take the water course into and through his own garden." "3 May 1836 - It appearing to the Commissioners that the ancient watering place in Rackleford adjoining the Pall Inn commonly called the Horse Pond is unnecessary and that same is an annoyance to the Inhabitants of that neighbourhood, and that it would be a material improvement to the Town if such Pond were done away with - It is ordered that the same be drained and filled up - And that in lieu thereof a sufficient tank or reservoir be made for supplying water in case of fire - And also a trough for watering horses with a lip or spout of sufficient height to allow the placing of a bucket or other vessel underneath, or a pump, or both, as hereafter may be thought most advisable for furnishing the Inhabitants with Water. The Custos and Wardens of the Yeovil Almshouse, owners of the Dwellinghouse called the Pall Inn in Reckleford within the Town of Yeovil adjoining the scite of the ancient watering place called the Horse Pond which is now ordered to be drained and filled up, having taken down such House for the purpose of rebuilding the same, and such House as having heretofore having projected beyond the regular line of the Street and and the Range of the adjoining Buildings the Commissioners have in pursuance of the powers vested in them by the Act of Parliament required that the same when rebuilt shall be added to the street for the purpose of widening the same to which requisition the said Custos and Wardens.... in a line with the foot of the adjoining House belonging to Mr Samuel Duffett and that the ground or scite of such projection shall be added to the street and as a compensation for their so doing the Commissioners do hereby allot and award unto and for the said Custos and Wardens so many feet of land adjoining to the said Dwellinghouse called the Pall at the north thereof (being part of the scite of the Horse Pond) for the purpose of bringing them but not for the erecting of outhouses or any other purpose, as will be equal to the number of feet so given up by the Custos and Wardens and added to the street and the said Custos and Wardens have by a minute in their Book of proceedings consented to such exchange and agreed to accept such compensation as last hereinbefore is mentioned. It is further ordered that in case the Custos and Wardens shall not require the full quantity of land hereinbefore specified to be given up to them that they shall be paid by the Commissioners for any deficiency in quantity at the rate of 1s. per square foot."